Panderbear just loves charts. They'd be the perfect antidote for low-information voters if they weren't so determined to stay low-information. Sigh. 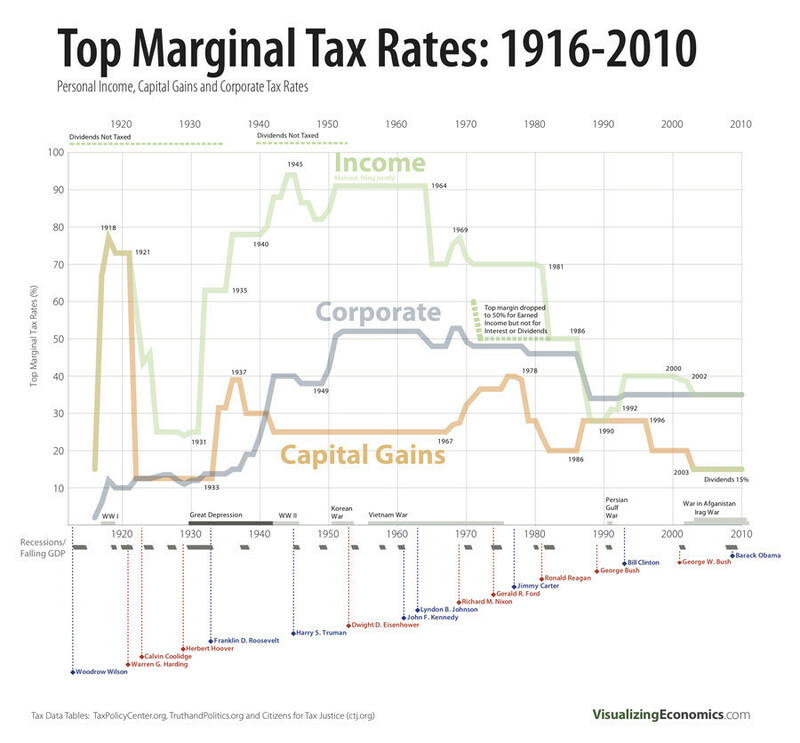 This chart shows the history of top marginal tax rates from 1916 through 2010. Note that personal income, corporate income, and capital gains are taxed at different rates. 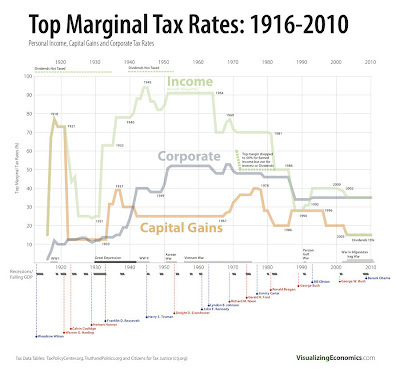 Generally, capital gains are taxed at the lowest rate, corporate profits at an intermediate rate, and personal income at the highest rate of all. The income of the rich often consists mostly or entirely of capital gains which are currently taxed at a modest 15%. You are likely paying a much higher rate than that on your last dollar of income, especially if you include Social Security and Medicare, i.e. payroll taxes. As billionaire Warren Buffett is fond of pointing out he pays a lower tax rate than his cleaning lady. Buffett goes on to say the wealthy have never had it so good. He should know. At present corporate and individual rates are nominally equal. However, with their ability to shift profits offshore and convert profits into capital gains, corporations actually pay much lower rates. Many corporate giants like General Electric use this strategy so well that some years their profits are in the billions of dollars and yet they pay no federal income tax at all. Zero. There is much more to glean from this chart, but for now Panderbear will just point out that all three tax rates are far below their post-depression averages. This puts the lie to the Republican and Tea Party meme that taxes are too high. Panderbear has some sympathy for the notion that the middle class is overtaxed, but conservatives do not favor tax cuts targeted at the middle class. The Bush tax cuts went mostly to "job creators," aka the wealthy. Unfortunately, the widening wealth gap and high unemployment suggest that rather than creating jobs, they just put the money in their pockets.